On the 25 January, Phillip took the Supply and returned to Sydney Cove with the rest of the fleet to follow when the wind conditions allowed. 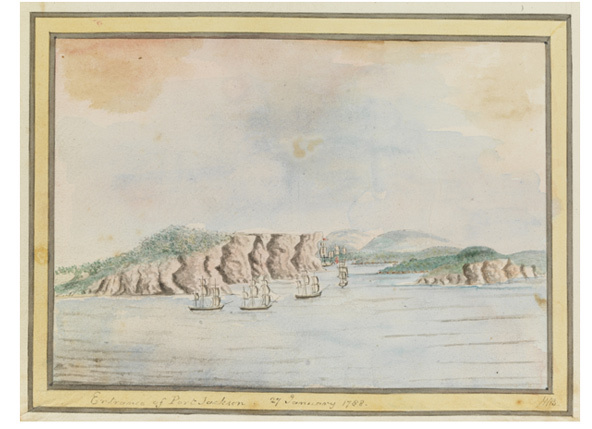 "On the 25th of January therefore, seven days after the arrival of the Supply, Governor Phillip quitted Botany Bay in the same ship, and sailed to Port Jackson." 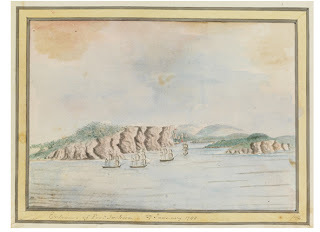 "The governor, with a party of marines, and some artificers selected from among the seamen of the Sirius and the convicts, arrived in Port Jackson, and anchored off the mouth of the cove intended for the settlement on the evening of the 25th; and in the course of the following day sufficient ground was cleared for encamping the officer's guard and the convicts who had been landed in the morning. The spot chosen for this purpose was at the head of the cove, near the run of fresh water." "Friday. 25th. The Transports were reported ready to proceed with the Sirius. AM. The Supply got under sail with 2 Long boats, at 6 the signal was made for the Convoy to get under weigh which most of them did, the flood tide ran so strong that they fell to leeward on which the signal was made to Anchor."